31 December 2008 - Slashed near car park, picnic area, bank and area west of Chris Cross, September planting area, plus 1 metre along bike path north of Chris Cross (at the request of a path user who is concerned about snakes crossing the path in this area). Approx. 5 hours work. 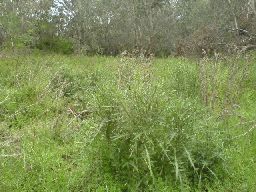 18 December 2008 - Grubbed out more spear thistles in the billabong, along with some Inkweed, Deadly nightshade, and Madeira Winter cherry. 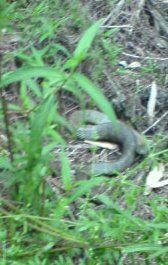 Disturbed what appeared to be a blue tongue lizard before it scuttled away (at least it had 4 legs). approx. 2½ hours work. 17 December 2008 - Planted 100 Poa labs (Poa labillardierei) and 3 Austral Stork's Bill (Pelargonium australe) around picnic area. Approx. 2 hours work. 10 December 2008 - Slashed picnic area, east of of picnic area and bank west of Chris Cross. approx. 2 hours work. 24 November 2008 - Placed another 2 bat tubes in the picnic area. 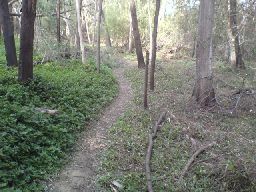 Cleared the billabong of spear thistle again, while a snake watched (pictured left) and also removed a small area of Madeira Winter Cherry Solanum pseudocapsicum and Sweet Pittosporum. Then slashed around the plantings to the west of Chris Cross and scared off a smaller snake (pictured right). 4½ hours work. 20 November 2008 - Planted 25 Common Correa Correa reflexa (pictured left) and Common everlasting Chrysocephalum apiculatum (pictured right) around picnic area using water crystals. Slashed area north of picnic area around September plantings. 2½ hours work. 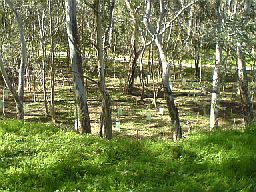 17 November 2008 - Slashed around picnic area and in 'kikuyu" area east of picnic area. 2 hours work. 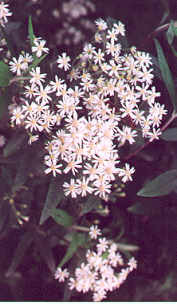 Tubestock planted in September looks to have 90%+ success rate with Snowy Daisy Bush Olearia lirata particularly successful. RMIT Conservation & Land Management students under the tutelage of Bruce Partland completed the draft Management Plan on 10 November 2008 - THANK YOU ALL. The Committee of Management was incorporated on 5/6 November 2008. 22 & 24 October 2008 - Removed Spear thistles from the billabong floor. Aim - no spear thistle seeds this year. 2 hours work each day. Found another small patch of Goodenias on west bank of North-east corner of billabong. 16 October 2008 - With record low rainfall for September, and 9.5 mm rainfall for this month so far (average 65.8mm), and no rain forecast for the coming week, it was time to water the plants planted on 25 September. 1 litre per plant of mostly Yarra River water. 2 hours work. 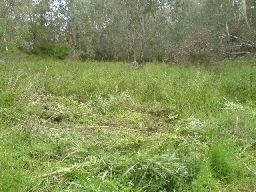 1 October 2008 - Removed 5 small Gorse bushes and 3 small Bitou bushes from south bank of the Billabong. Pulled some Madeira winter-cherry and Sweet pittosporum on the way there and back. 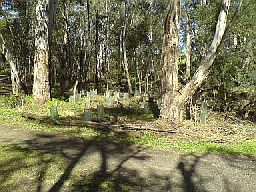 Planted 23 Dianellas and 3 Goodenias near car park. 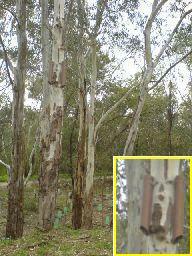 Installed 8 bat tubes on 4 river red gums near car park. 1½ hours work. 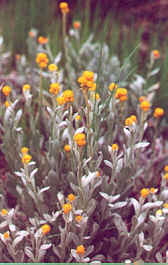 25 September 2008 - 2 members of the Committee of Management and Staff from the Box Hill Office, Public Land Management section of the Department of Sustainability & Environment had a planting day and planted 400 plants; Snowy Daisy Bush Olearia lirata, Prickly Tea tree Leptospemum continentale, Wooly tea tree L. lanigerum, Swamp Paperbark Melaleuca ericifolia, River Bottle Brush Callistemon sieberi 20 x 5 hours work. 24 September 2008 - David Cummings and I weeded the billabong floor, concentrating on Spear thistle before it flowers and with distractions to Madeira Winter cherry and Sweet Pittosporum. Collected 400 plants from VINC for the DSE planting day on 25 Sept. 2 x 5 hours work. 13 September 2008 - Slashed Angled onion in the lower area b/w Chris Cross and bike path (D7), and to the west of Chris Cross (E7) in preparation for DSE planting day on 25 Sept. 2½ hours work. 11 September 2008 - Slashed re-emergent Trad in the lower area b/w Chris Cross and bike path (D7), and to the west of Chris Cross (E7). Weeded sweet Pittosporum, blackberry and Madeira winter cherry in this area. 2½ hours work. 27 August 2008 - planted a few dianella, 40 Poas, and killed 4 bitou bushes (related to boneseed), and some sweet pittosporum, before I got stuck into the spear thistle in the billabong floor (estimate 1000 - 2000 killed). 3½ hours work. 22 August 2008 - Slashed weeds around Chris Cross access track area and moved on to river bank area next to Burke Rd. bridge. Cut and painted 1 boxthorn, 1 cotoneaster and 5 Hawthorns. 3 hours work. 16 August 2008 - Slashed weeds around Chris Cross access track area. 1 hours work. 13 August 2008 - Weeded plants around Chris Cross access track area. Planted 20 Dianella, placed weedmats (homemade cardboard) around some recent plantings and replaced about 10 Kangaroo Apple / Goodenia that had died. A Dianella near 'picnic area' is flowering. 3 hours work. VINC 500. 17 July 2008 - Sprayed around Chris Cross access track area. Cut a large section of the Boxthorn near Burke Rd. bridge. The boxthorn is now about ¾ demolished. 3 hours work. 14 July 2008 - Visited Billabong with RMIT Diploma of Conservation & Land Management students (2nd year). As part of the course, we need to write a Management Plan and it is proposed that we do a Plan for the Billabong area. It is proposed that DSE will then put the plan up for public comment, and 'launch' the final plan. 7 July 2008 - Potted up 80 Snowy Daisy bush Olearia lirata cuttings taken from Herring Island on Sunday 6 July. VINC had no tube stock. 25 June 2008 - Weeded around plantings. Sprayed trad that was slashed on 17 June in area E6 and around Chris Cross access track area. 2 hours work. 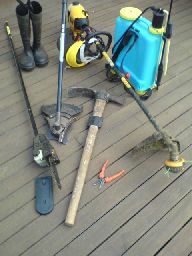 Picture shows the work kit; whipper-snipper with attachments (brushcutter, pole saw), backpack spray, mattock and cuttings scissors. Safety gear; mesh visor, ear muffs, boots. 17 June 2008 - Cut down more boxthorn (D8) and sprayed (50% glyphosate) the stumps - now over half cut down, and cut and sprayed some Hawthorn in southwest corner of Billabong (E6). Slashed trad around bottom of E6. 3 hours work. BMXers have been redone jumps since last week (some are almost mountains) and another wattle broken in the process. 12 June 2008 - Weeded around plantings. Slashed trad in area C6. 2½ hours work. 6 June 2008 - Cut down more boxthorn (D8), 1 large Cotoneaster, Tree Lucerne, and some Hawthorn on bank west of Chris Cross (E6). Slashed trad around top of E6. 2½ hours work. 29 May 2008 - Weeded/slashed around plantings. The recent rain has produced a good crop of soursop and angled onion around the plantings. Planted 5 Kangaroo Apple, replaced 2 dead plantings and planted 10 Kangaroo Apple seed pods. Cut down 3 Tree Lucerne, a Prunus and some Boxthorn. 4 hours work. 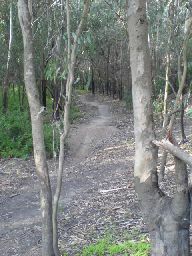 13 May 2008 - Demolished BMX jumps in billabong and covered with broken branches - some broken off to make the track. Photos shows before and after. Weeded Madeira winter cherry and Sweet Pittosporum seedlings (approx 200 & 50 respectively) in this area (top of E6). Planted 15 Goodenia and 5 Dianella along northern section of bank west of Chris Cross. 8 May 2008 - Slashed the Trad and blackberry on the bank west of Chris Cross garden centre - nearly to the end of the billabong area. Weeded around some of the recent plantings. Approx. 2½ hours work. 17 April 2008 - Sprayed the area between the picnic area and the bike path a second time [16 L glyphosate 360gpL mixed at 12ml/L] and for the first time in area west of the picnic area [16 L glyphosate 360gpL mixed at 12ml/L]. Took some more Kangaroo Apple cuttings  from next to the car park track. Continued slashing the Trad left on 10 April - some of this area will need hand weeding because of the amount of Tree Violet seedlings. Approx. 2½ hours work. Photo shows the slashed area compared with unslashed. 14 April 2008 - Planted 29 Dianella, 27 Poa, 20 Kangaroo Apple and 15 Goodenia around the 'picnic' area. Approx. 1½ hours work. 10 April 2008 - Continued slashing the area west of the 'picnic' area (north-west corner of D7). Approx. 1½ hours work slashing. 1 April 2008 - After approx. 50mm of rain in the last week, planted approx 50 Kangaroo Apple and Goodenia to replace all of the late planted Kangaroo Apple and Goodenia that did not survive summer. Planted 20 Poas at the bottom of the Chris Cross track and the Dianella down the track. Continued along the bank below the picnic area with some more Kangaroo Apple and Goodenia. Assisted by David Cummings. 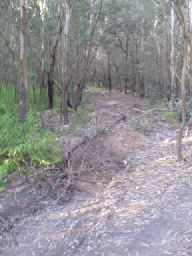 Trimmed the weeded trees on the lower area and formed a log barrier 1 - 2 metres back from the bike path. 3 ½ hours work. 20 March 2008 - Continued slashing the area west of the 'picnic' area (north-west corner of D7). Slashed the 2 small areas of blackberries which were too large for the whipper-snipper and pulled out some Madeira Winter Cherry (Solanum pseudocapsicum). Dispatched a couple of Prunus trees in 'picnic' area and started to work on Box-thorn next to Burke Rd. [D8]. Reasonable recruitment of Tree Violet (Melicytus dentatus = Hymenanthera dentata) in this area. Have divided some more Poa labillarderei. Now have 200 Poas, 50 Native Pepper Cress, and 100 each of Kangaroo Apple, Goodenia and Dianella to plant whenever we get some rain. 1.4mm so far in March and have lost a few of the late planted Kangaroo Apple and Goodenia, the others are looking very thirsty. Approx. 3 hours work slashing. 11 March 2008 - Slashed the Trad south of the area slashed on 26 Feb. ¾ hour slashing. Area sprayed on 3 March starting to show the effects. 3 March 2008 - Sprayed around the picnic area and the area between there and the bike path where the Trad had been slashed b/w 5 Jan and 2 Feb [45 L glyphosate 360gpL mixed at 12ml/L]. Took some more Goodenia cuttings  from this area. Slashed the blackberry left on 26 Feb. Noted the grass area south and west of the billabong [F5 - G6] has been slashed since late December. Approx. 3 hours work spraying and ½ hour slashing. 26 February 2008 - Finished slashing the area west of the 'picnic' area (north-west corner of D7). Dispatched a couple of Hawthorn trees in this area. Still to be done are 2 small areas of blackberries which were too large for the whipper-snipper. Have divided some more Poa labillarderei as last week's seem to have sent out more roots and are looking healthy. Now have 150 Poa labillarderei. Approx. 3 hours work slashing. 21 February 2008 - Purchased another slasher today and finished slashing the 'picnic' area near the Chris Cross path. Cut down the 3 prunus trees and another weed tree to the east of the 'picnic' area. work. Started to slash the area west of this area (north-west corner of D7). Approx. 1½ hours work. 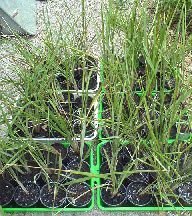 Visited VINC on Friday 17th, and obtained 100 Poa labillarderei which were destined to be disposed of as they were extremely root bound. Have divided some to check how well they divide. 2 February 2008 - Finished slashing area b/w bike path and north of track from Garden Centre (Map D7 - D8). Will follow up with a spraying of glyphosate. The area slashed on 5, 14 & 28 Jan. now has a layer of mulch with some re-emergent Trad. Started to slash the 'picnic' area near the Chris Cross path but the slasher stopped half way through and refused to start again. [It was terminal!] Pulled some Kapok vine from trees in area to the east. Cut down the 2 prunus trees and the hawthorn tree referred to on 14 Jan. work. Only the area of African box thorn (aaaagh!) left to be cut down in this area. Approx. 2½ hours work. 28 January 2008 - Gave some of the recent plantings a drink. Slashed area b/w bike path and north of track from Garden Centre (Map D7 - D8), east of previous slashing . Will follow up with a spraying of glyphosate. The area slashed on 5 & 14 Jan. now has a layer of mulch with some re-emergent Trad. Pulled some Kapok vine from trees in area to the east. The vine had bent four trees over breaking two. Approx. 2½ hours work. 26 January 2008 - A sign at work (DSE/DPI Box Hill) asking for small pots for reveg work resulted in about 130 pots. Collected dianella rootstock at Herring Island and divided them into about 70 plants (pictured at left). Approx 2 hours work. 14 January 2008 - Gave some of the recent plantings a drink. Continued slashing area b/w bike path and north of track from Garden Centre (Map D7) which is now all slashed. Will follow up with a spraying of glyphosate. The area slashed on 5 Jan. now has a layer of mulch with some re-emergent Trad. Cut (but no herbicide) about 6 hawthorn and plum trees in this area and pulled out about 6 Madeira Winter Cherry (Solanum pseudocapsicum). Only two large weed trees to still be cut in this area. Pulled some Kapok vine from trees in area to the west. Approx 2 hours work. 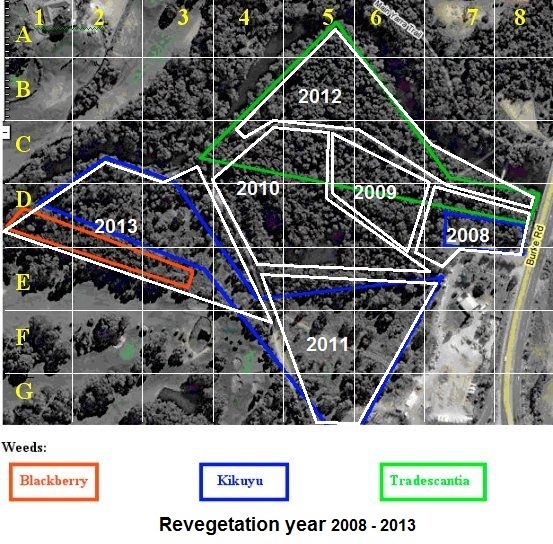 Wednesday 9 January 2008 - Nature Links sprayed blackberry in 'Pastoral Woodland' on western boundary which was inaccessible in August, in grassland south of billabong and along bank to the west of Chris Cross Garden Centre. 5 January 2008 - Gave some of the recent plantings a drink. The area of trad (Tradescantia albiflora) that had received 2 doses of spray was still only looking unhealthy. Some of the websites that I have checked recently for successful techniques to get rid of it seemed to have more discussion (argument) as to its common name rather than how you can get rid of it easily. Am trying an experiment to slash area b/w bike path and north of track from Garden Centre (Map D7). Will follow up with a spraying of glyphosate. Slashing should reduce the biomass for spraying (about 30cm lower), and does give a noticeable effect immediately. Hopefully, there will be a mulch left after as well. Approx 1.5 hours work. 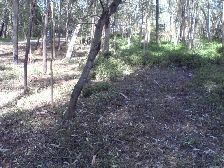 A picture of the area (taken 9 days later showing cleared area with Trad (Tradescantia albiflora) in the middle distance standing about 40 cms high ).